Cyclosporine is an immunosuppressant, and slows down the immune system (thus frequently prescribe to prevent organ rejection after a transplant). It is registered in certain countries to treat skin conditions – psoriasis and atopic dermatitis (eczema). It may be prescribed for those with severe eczema that has not responded to other treatments for prolonged period. Cyclosporine works by reducing inflammation on the skin, through its effect on immune cells (lymphocytes). It is taken orally, and patient needs to follow the prescription carefully and take the medication at same time. The dosage prescribed will be determined by the doctor, usually for skin-related, it will be a low dosage, and dosage may vary during the course. It is important to follow-through with the prescription, and not terminate it once you self-assessed your condition has improved. Certain tests may be requested by your doctor, to assess the side effects of cyclosporine, such as blood pressure test, blood and urine tests (to monitor creatinine levels) and tests to monitor potassium, blood count, fasting lipid, uric acid and liver function. 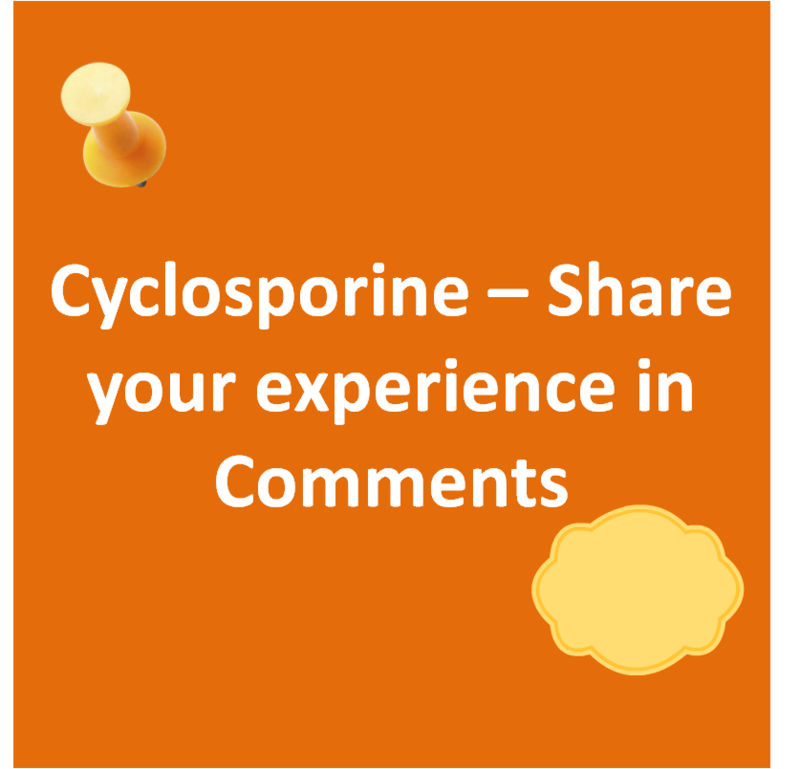 Care ought to be taken to ensure that the prescription of Cyclosporine is the right one, as it can be in different form – original vs modified. Different form of cyclosporine is to be mixed with different liquids, so do check with your doctor too. Also check with your doctor on what other medication to avoid, especially those that affect the immune system, such as azathioprine, methotrexate and tacrolimus. There is associated risk with high blood pressure, kidney damage, lymph and skin cancer, so do check with the doctor if your child should take additional sun protection measures, and for adults, avoid phototherapy during the medication. Do not drive as side effect of cyclosporine is dizziness. Avoid contact with people who are ill, and also those who have taken a recent nasal flu vaccine (also check with the doctor before you/ your child get vaccinated). Headache, vomiting, diarrhea, nausea, increased hair growth on face or body, swollen gums, acne, trembling, flushing, cramps, joint pains, pin and needle sensation, flu, sore throat, facial pain and increased blood pressure . The serious side effects to call your doctor immediately are bleeding, bruising, paleness, yellowing of skin or eyes, seizures, fainting, difficulty with body movements, swelling and vision changes, painful urination. Refer here which side effects are more common, and which are less. Grapefruit and juice is to be avoided as it can increase the amount of cyclosporine in your blood stream. Foods such as bananas, prunes that are high in potassium are to be limited as cyclosporine can also increase the amount of potassium in the bloodstream. Check also if you need to take magnesium supplement, as cyclosporine may reduce the level of magnesium in the blood. Studied to offer relief for those with severe eczema, but the effect is not long-lasting, similar conclusion in this study. Review article of 15 studies found cyclosporine to be effective for 6-8 weeks. One study that tracked up to 1 year continued to show eczema in remission, but this study was without control group. A point to note is above studies were small sample sizes, possibly due to cyclosporine prescribed only for severe instances. Do share your experience in the comments! I could only find this on the website, seemed like 1 to 6 month is the most common period..
Hope it gets better soon, is it helping the eczema? Wow, this med seems like an extreme resort to use on a child. It saddens me that there are kids who suffer so badly to need meds like this. Yes, I’m researching more on eczema meds, and realized that there are even stronger meds than cyclosporine, used when kids didn’t respond to cycolosporine and conventional med, or due to its side effects. It’s very saddening, as it impacts immune system at the time when the little bodies of the children are trying to build it up.. I never heard of these meds, till I kept reading them in forums.. The “cure” was to stop the drug and the cells went away. A bitter sweet ending, since I was out of danger, but my eczema came back in full force. I ended up on Cellcept 2 years later which has been effective and safe for the past 5-6 years.